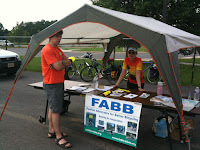 Several FABB members were present yesterday for the first Braddock Bike Day at Lake Braddock High School. 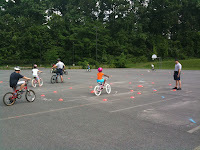 Fairfax Co police were on hand to conduct a bike rodeo. 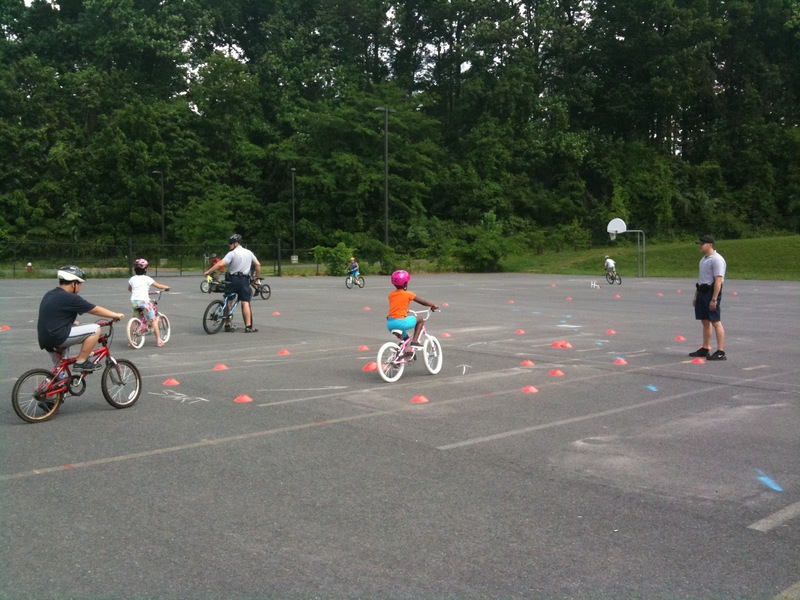 Kids were given a safety talk first and then were led through the course that consisted of several bike handling drills: a tight turning course, a balance test, a figure 8 course, weaving between cones, and a stopping drill. Oasis Bike Works was on hand to check out the kid's bikes and do safety checks and minor repairs on other bikes. Supervisor Cook and his staff were there and we discussed possible options for the event next year. There was a small turnout, which is to be expected on the first year of the event. We talked to the few people who stopped by our table about our bike advocacy activities and discussed bike routes in the area. Next year we hope there are other activities that could draw more participants. Having a bike tour of the area would be one possibility, similar to the Tour de Lee that was held for several years in the Lee District. We rode to the event from Reston, carrying the canopy that you see in the photo on the left, that was donated by REI, along with other supplies in our BOB trailer. It was a nice18 mile ride along the W&OD Trail to Vienna, then taking back roads past the Vienna Metro station to Five Oaks Dr to Plantation Parkway to Route 50, and University Dr to the GMU campus. There are new shared lane markings on George Mason Blvd leading into the Campus. I should say there was one shared lane marking; there need to be more. As evidenced by the motorist who honked at us as we approached the campus, motorists haven't gotten the word to expect bikes on the road. From GMU we took Sideburn Rd to Commonwealth Blvd which turns into Gunea Rd to Olley Lane to Lake Braddock Rd to the high school. Douglas Stewart, a volunteer for Fairfax Advocates for Better Bicycling, or FABB, stressed basic bicycle care. Stewart also promoted the creation of more bicycle-friendly county roads. 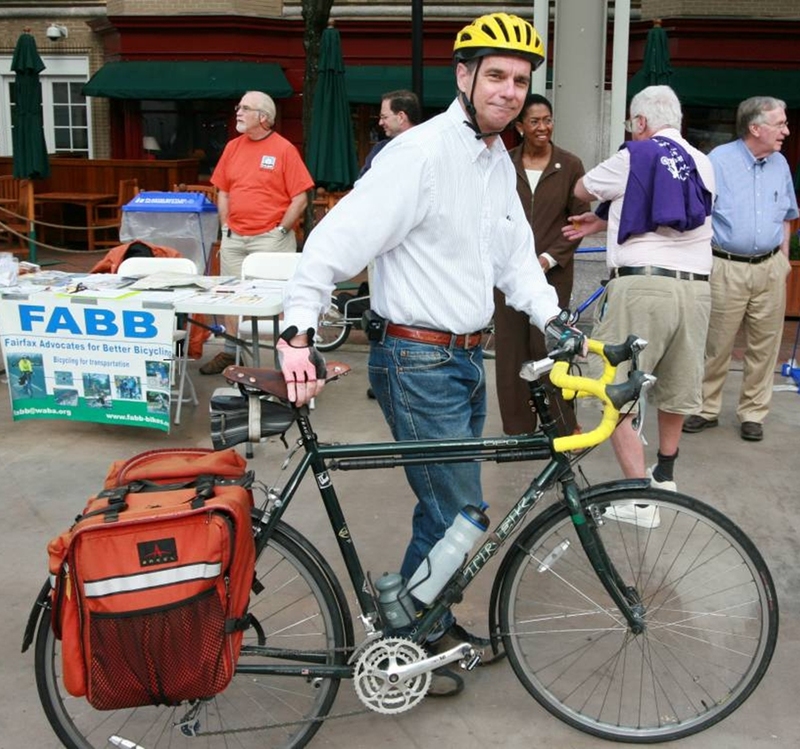 FABB’s goal is to “make biking better in Fairfax County,” he said, and group members distributed fact sheets about increasing bicycle transportation. The City of Fairfax has begun creating “sharrows”— road markings indicating bicycle lanes, Stewart said, but Fairfax County needs to build these extra road passages too. The Herndon Festival will feature a Bike Valet service till dusk on Saturday and 6 p.m. on Sunday provided by the Pedestrian and Bicycle Advisory Committee. The Bike Valet is a free service. Bike racks will be located at the intersection of Elden and Lynn Streets. The Bike Lane will be on hand to help with repairs and tune ups. Relax and enjoy the Festival - knowing your bike is safe with the Bike Valet. Ian is looking for volunteers to help staff the valet. If you can help please let Ian know your availability at bikevalet@email.iwasdot.com. 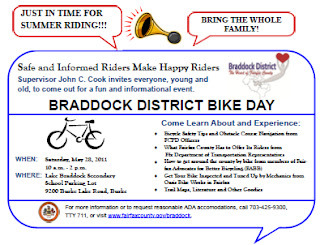 The Braddock District is hosting Braddock Bike Day this Saturday, May 28 from 10-2 p.m. at Lake Braddock Secondary School. Members of the Fairfax County Police bike team will be on hand to conduct a bike rodeo and discuss bike safety. This is also a good chance to have your child's (and your) bike checked out by mechanics from Oasis Bike Works, a locally owned bike shop in the City of Fairfax. FABB will be on hand to discuss our work including promoting Safe Routes to School and bicycle education. If you're staying in town for the holiday why not check out the event. This is the first year the event is being held and we're encouraged that Supervisor Cook is supporting bicycling in his district. For the second year in a row a Fairfax bicyclist was involved in a collision with a motorist on Bike to Work Day. Last year Abdul Chadli was killed when a motorist lost control of his vehicle and struck and killed Abdul as he was crossing Forum Dr at Lee Hwy/Rt 29. This year a cyclist was riding on the sidewalk along Main St in Fairfax City when the driver of an ice cream truck turned onto Main St and struck the cyclist and dragged him for a short distance. The cyclist was riding down the sidewalk westbound on Main Street when he was hit by an ice cream truck attempting to turn out of the Fairfax Square Apartment complex shortly after 7 p.m. on Friday. The truck ran him over and dragged him for a brief time. His injuries were non-life threatening, said Sgt. Daniel Grimm of the Fairfax City Police Department. Impha Gassama, 52, from New Carrollton, Md. was charged with failing to yield the right of way from a private drive. See the Fairfax City Patch article along with the FABB comment on the crash. The Bicycle Commuter Tax Benefit has been in place since January 2009. Bicycle commuters who bike 3 or more times a week for a month can receive $20 toward bike commuting expenses. Unfortunately not many companies have implemented the benefit. It cannot be used in conjunction with the transit benefit. It's not easy to implement. Increase the amount of the bike commuter benefit from $20 to $40 a month. Allow bike commuters to combine the bike commuter benefit with other fringe benefits — up to $200. For example, You could use the $40 bike benefit and collect up to $160 of your public transit benefit. Cap all transportation fringe benefits at $200 a month (the parking benefit is currently $230, the transit cap will drop to $130 at the end of 2011). Allow self-employed people to receive transit fringe benefits for work-related commuting. Require employers offering a parking transportation fringe benefit to also offer employees the option to take cash instead. This would create an incentive for more people to leave the car at home and take cheaper options, like transit, biking, and walking. "With the some of the worst traffic in the nation, Northern Virginians are no strangers to wasting gasoline while sitting in rush hour traffic," said Moran. "Providing incentives for commuters to carpool, bike, or take public transportation is not only good for our environment, but for our pocketbooks. It’s one of the best ways we can address traffic congestion in the region." It was also a record-breaking year for the three Vienna elementary schools that participated in the third annual Walk/Bike challenge, a week-long program that pit Cunningham Park, Wolftrap and Vienna Elementary students against one another to see how many of them could leave their cars at home and get to school on foot instead. A total of 644 students across three schools biked or walked to class on Friday -- a number that surpassed the week's next highest participation number by nearly 100. Wolftrap Elementary School hit a single-morning record on Friday with 89 bikers. Principal Anita Blain joined the school's bike train this morning on their last run. Cunningham Park surpassed its week-high by 50 students, and Vienna doubled its number of bikers. Tara MacCall, the parent organizer at Vienna Elementary School, said she wanted to continue a weekly bike train on Fridays, with a post-dropoff bike ride for the parents. Organizers at all three schools will present awards to students in the coming weeks. "We're always encouraging our kids to do more," MacCall said. "Hopefully we'll continue [walking and biking to school], since its spring and the weather is nice." Congratulations to Jeff Anderson and all of the other organizers of the event; they are doing great work getting kids out walking and biking to school. Friday morning turned out to be mild and sunny and a great day for celebrating biking to work. FABB reps attended all Fairfax Bike to Work Day events, discussing bike routes, giving commuting advice, and signing up people for our e-newsletter. I attended the Reston event that I've helped organize for the past 10 years. Reston and Vienna were the first BTWD events in Fairfax and the Reston event is the largest in the county. National Bike to Work day was May 20th, 2011, and the Reston community proudly sponsored a morning Pit Stop. 420 registered riders were in attendance. 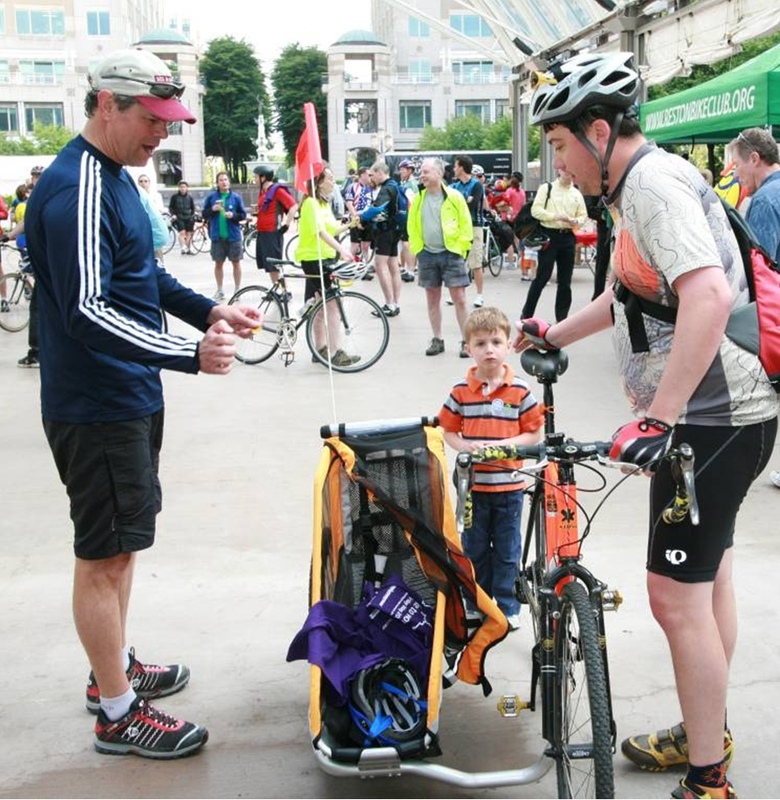 The Washington Area Bicycling Association sponsored 49 Pit Stops throughout the region. Thanks to a generous donation of pavilion space at Reston Town Center, the spacious, covered location worked out well for bicycle riders to stop by, get refreshments and learn more about bicycling. Though May can have rain, the blue sky weather was ideal for cycling, with temperatures at dawn just above 60 degrees, and just below 70 degrees at the end of the event, 9 am. Several local leaders spoke in support of bicycle usage. Fairfax Advocates for Better Bicycling leader Bruce Wright, who co-organized the event, welcomed commuters and the elected officials. Ken Plum, Virginia State Congressman, took the mic and explained how practical a recent multi-mode commuter challenge found bicycles to be. More on that topic follows below in the Bike-Car-Bus Challenge link. Cathy Hudgins, Hunter Mill Supervisor, mentioned that planning for bicycle access to the new Metro Train was in the works. Kathleen Driscoll McKee, Reston Association President, related an anecdote on how well bicycle riding can fit into an active lifestyle with a good fitness result. Reston Association staff member Liz Badley handled the duties of handling out the many door prizes by raffle held throughout the morning. Food was available, thanks to Community Canteen of Reston and Great Harvest Bread of Herndon. Coffee, muffins and sandwiches kept commuters going. The Reston Bike Club tent was well staffed and focused on presenting recreation, fitness and service opportunities to attendees. Other fitness and fitness event exhibitors included the YMCA and Tour de Cure. The Link organization, funded by the Reston Town Center Association, informed the public about transportation options. The Bike Lane, a local bicycle shop, provided a mechanic. Attendees arrived with a wide variety of bicycles, including a modern “pedal forward” design with “relaxed geometry”, several styles of trailers, and even a sidecar. Links to various associated sites follow. Wolf Trap ES holds a slim lead in the Bike/Walk Challenge. Let's hope all the kids who are walking and biking discover the joys of being independent and getting exercise in the outdoors and that they continue to walk and bike throughout the year. See the latest results in the Patch article Walk/Bike Challenge Day Three: More Than 500 Walk Or Bike To School. What is it with the Post lately? In another negative article about cyclist behavior (Cars, trucks and bikes: Can we all get along? or "Safety reminders for Bike to Work Day" depending on where it appears) reporter Ashley Halsey III writes about all the scofflaw cyclists out there. In a time when motorists are barely hesitating before turning right on red and nearly all of them exceed the speed limit, he concentrates on bicyclists' bad behavior. Sure there are plenty of cyclists who disregard stop signs and run red lights, but yesterday while walking in Vienna I saw one motorists almost hit a pedestrian because the motorists tried to make a right on red without stopping. At the next intersection a Postal Service truck ran a solid red light on Maple Ave where there were plenty of pedestrians and cyclists around. This is blatant behavior that we see every day at every intersection and yet the Post focuses on bicyclists. Makes you wonder. "I wish that instead of a week (of biking and walking to school) we could have a whole year; it's the right thing to do. I hope this is one of the examples that we can showcase to say that Fairfax County, we're getting it right. We're hoping the county and school system will respond and make this a part of our daily lives. Our kids will grow up healthier, more conscious of their environment, more conscious of how things like this affect all of our lives here and our quality of life." Three elementary schools in the Vienna area are holding a bike/walk challenge this week; Vienna, Cunningham Park, and Wolftrap. Jeff Anderson of Wolf Trap ES has been running regular bike trains during the school year and this week they'll have a train running every day. On Friday there was a pre-challenge bike train at Wolf Trap that was joined by Trek-Livestrong racer Joe Dombrowski. This morning was the first day of the challenge. Wolftrap had 33 bikers/138 walkers. Vienna had 117 total bikers and walkers. We're still awaiting results from Cunningham Park. We'll post results as we receive them throughout the week. A bicycle locker is a "garage" for your bike that provides a way to store your bicycle securely out of the rain, sun, and snow. The bicycle lockers are owned and operated by Fairfax County Dept of Transportation. FCDOT has generously waived the fees for one year and Reston Town Center Association has donated the key deposit for one locker. The Sunset Hills Park and Ride is located at 12050 Sunset Hills Road at Town Center Parkway, next to the W&OD trail, 1/3 mile from Reston Town Center Pavilion. If interested in the locker, please provide your name and contact information on your business card or the form provided and drop it in the bucket. The winner will be notified after Reston Bike to Work Day concludes. Follow the Reston Pit Stop on Twitter. We recently attended the public hearing on VDOT's Six Year Improvement Program. The meeting was held at VDOT's N. Va. District office, which is now located on West Ox Road near the Fairfax County Parkway. 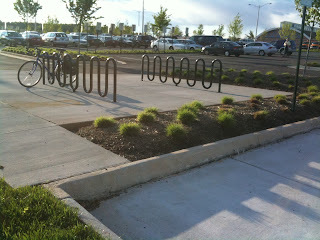 This was our first visit to the new building and we were disappointed with the bike parking that was provided. LEED Silver certification of the building is pending. Unfortunately the LEED bicycle storage specifications are very weak. Racks can be located as far away as 200 feet from the building and there appears to be no guidance regarding type of rack used. This is in contrast to Arlington's requirements that visitor parking be located within 50 feet of the building and that U-racks be used. At the VDOT building the infamous wave racks are used and they are located across the entrance drive in a corner of the parking lot. The parking is not covered. As we rode up to toward the racks we noticed there are no curb ramps to allow access. We had to ride to the front of the building, onto a sidewalk leading to the racks. Not only is this poor design, but it's a bad example for others. VDOT should know better and should be setting a better example for others. Traffic accidents are the ninth-leading cause of death worldwide and are expected to move to fifth place over the next 25 years. They are the leading killer of teenagers and young adults, causing more deaths among that group than AIDS. More than 90 percent of traffic fatality victims are in the developing world, and half are motorcyclists, bicyclists or pedestrians. The strategy is to create demand for safer roads, stricter laws and better driving in countries where the toll of traffic injuries is unusually high. It will provide transportation and public health agencies in those places with a tool kit of interventions - seat belt laws, lowered limits for alcohol-impaired driving, dedicated bike lanes, license restrictions for teenagers, improved ambulance service - that have proved lifesaving elsewhere. "Road safety is coming out of the shadows today, and it is time," said Etienne Krug, head of the injury prevention department at the WHO in Geneva. "Historically there has never been much international attention on this, and we have never had that level of attention from high government officials," Krug said. Many people have long commutes and think that biking to work is not possible for them. However, there are many options for using your bike for part of your commute to work. During a bike commuting seminar in Tysons last week we heard about one employee who takes his bike on the commuter bus from Ashburn in the morning and then rides home after work. The one-way 16 mile commute home is a great way to reduce stress and get a workout, and he's not as concerned about being sweaty. Washington, D.C. - Commuter Connections urges commuters whose trip to work is too far to travel by bicycle alone to participate in Bike to Work Day (BTWD) on May 20 by cycling to their local Metro station, bus stop or park and ride lot. 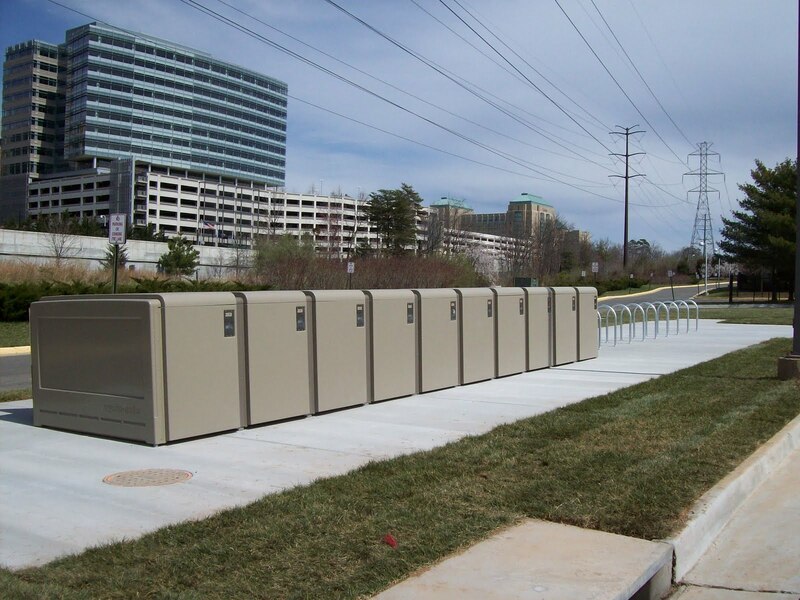 With 1,700 free bike racks and 1,280 lockers available for rental in the Metro system and every Metrobus equipped with a rack for two bikes, even those with a long commute can enjoy the health-, environment- and cost-saving benefits of cycling to work. Metrorail's Bike ‘N Ride program also permits cyclists to bring their bikes on railcars during certain hours. "Bike to Work Day is an option even for those with long commutes," said Nicholas Ramfos, Director of Commuter Connections. A 2007 State of the Commute Survey by MWCOG found that drive-alone commuters traveled on average 16.4 miles one way and commuter rail riders traveled an average of 27 miles each way. "Our goal is to encourage commuters to think of ways to substitute their bicycles for the portion of their commute they may travel alone by car." Thousands of commuters have already registered for this year's BTWD event, and Commuter Connections and the Washington Area Bicyclist Association (WABA) are inviting all commuters to explore the many car-free commute options the area has to offer. There is still time to be among the first 9,000 bicyclists who register at www.waba.org to receive a free Bike to Work Day t-shirt and be entered into a raffle for prizes that include bicycles from Brompton, Giant, Jamis, and Linus, plus bike accessories. Last year a record number of commuters left their cars behind for a day to promote bicycling to work as a fun, healthy, environmentally friendly, and low-cost alternative to drive-alone commuting. This year, 49 pit stops will be available across the Washington Metropolitan region, offering cyclists food, beverages, speakers and chances to win prizes. When registering online at www.waba.org, cyclists will select which pit stop they will visit to pick up their free Bike to Work Day t-shirt. Cyclists can also choose to join one of over two dozen bicycle Commuter Convoys that are now being organized for Bike to Work Day. Commuter convoys are led by experienced bicycle commuters and will travel throughout the region. All bicyclists both new and experienced are welcome to join any of the convoys. Find a convenient convoy route to your work place here. The generous contributions of these major sponsors help to make Bike to Work Day a successful event - Marriott International, ICF International, DC Lottery, goDCgo, Whole Foods Market, AAA Mid-Atlantic, Bike Arlington, City of Alexandria, City Bikes and BicycleSPACE. 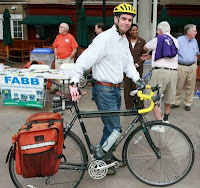 Gear Up and register for Bike to Work Day at www.waba.org or by calling 202-518-0524. Reston resident Adam Piceno says he's an enthusiastic biker and wanted his 3-year-old daughter Addison to start pedaling now. "This was a good chance to get her to come out and practice," he said. "She did well on the turns, but needed practice with the brakes." Ed Robichaud, Reston Bicycle Club board member, said the purpose of the event was to show kids that biking is fun, and to make it safer for them. By teaching them low speed handling, and focusing on the proper fit of the helmets and braking, it builds their confidence, he says. The Bicycle Club would like to see more children biking to school, and is planning to fund bike racks at local schools to promote cycling. Adam is a FABB member. It's great to hear that RBC plans to support biking to school. For more info on our efforts to generate support for the Safe Routes to School Program visit the Safe Routes to School Fairfax County Facebook page. 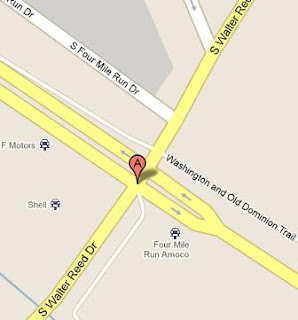 is near where the W&OD trail crosses Walter Reed Dr, but from the WJLA story it appears the cyclist was not using the trail. There is a steep slope on Walter Reed Dr and the cyclist was likely traveling fast when he turned. According to the police statement, "Investigation revealed that an adult man was riding his bicycle south on South Walter Reed Drive and turned right onto the access road of Four Mile Run Drive. "It appears that when he turned onto Four Mile Run Drive, he crossed into oncoming traffic and struck an occupied vehicle. The bicyclist was transported to a local hospital and pronounced dead. He will be identified once the next of kin has been notified." The Arlington County Police ask that any witnesses of the accident 703 558-2222, or Detective Don Fortunato at 703 228-4197. "Sharing the Streets" used incomplete data from a 2004 D.C. government report to unfairly single out cyclists. The study, which found cyclists slightly more likely to be at fault than drivers in accidents, included a critical fact the editorial ignored. Cyclists were faulted in 16 percent of crashes and drivers in 13 percent, but another 7 percent were hit-and-runs by drivers. Furthermore, the study was based on police reports, which are unreliable. In four crashes, cyclists were cited for sleeping. And the police often assign blame without interviewing the cyclist, who can be under doctor’s care when the investigation begins, which a recent study shows leads to cyclists being more often blamed. Many cyclists ignore traffic control devices such as stoplights, but so do drivers who, according to the Federal Highway Administration, also speed 70 percent of the time. Considering how much more reckless and dangerous drivers are, asking cyclists to follow the law "too" seems misplaced. Cyclists are still waiting for drivers to behave as well as we do. Try trails this spring is the title of a Dr. Gridlock article on local recreational biking and walking trails. In our recommendations we pointed out that bicyclists often prefer to ride on the road and that the Fairfax County Bike Route Map contains many good routes in the area. The W&OD Trail is often so crowded on the weekends that we often avoid it. Too many fast cyclists compete with dog walkers, joggers, people on roller blades, etc. What we hope to see in Fairfax in the future is a map of good on-road loop routes for cyclists, much like the Self-Guided Bike tours on the BikeArlington site. Check out the Dr. Gridlock article for short descriptions and links to resources on the most popular local trails. VDOT is proposing to add bike lanes to Soapstone Dr between Glade Dr and Sunrise Valley Dr. The project is similar to the restriping of Lawyers Rd which created almost 2 miles of bike lanes, reduced crashes, and reduced speeds. There was opposition to the Lawyers Rd project and it was only because cyclists attended the two public meetings and spoke out in support of the project that it was approved. According to the Hunter Mill District office, "A public meeting will be held to get community input on possible changes to Soapstone Drive pavement markings after the Virginia Department of Transportation (VDOT) repaving project in the summer. The meeting will take place on Monday, May 9th from 7-9 PM at Terraset Elementary School. VDOT and Fairfax County Department of Transportation staff will be available for a question and answer session." Please try to attend this important public meeting to learn what is being proposed by VDOT and speak out in support of the project. The bike lanes would connect to the Lawyers Rd bike lanes via the wide curb lanes on Soapstone south of Glade Dr. They would also connect to the shared use path along Sunrise Valley Dr and provide a bike route to the future Metro station at Wiehle Ave. See the public meeting notice on the Hunter Mill Facebook page. Washington Post columnist John Kelly recently traveled to the Netherlands to visit his wife who is working there. He wrote about their way of getting around in today's Post, "If only D.C. commuting were this smooth - or could it be?" What the Dutch are particularly good at is getting from one place to another. And the infrastructure that makes that possible can seem very foreign to a foreigner. First, of course, there are the bicycles, great herds of which ebb and flow across the cities and through the countryside every day. America’s capital is gaining a reputation as a bikeable city, but it has some ways to go to match the Dutch capital. Every sizeable road in the Hague has separate bike lanes — a set in each direction. Many bike lanes are protected from traffic with curbs. Then there’s the public transportation system in the Netherlands. What's especially neat about the OV-Chipkaart [a universal smart trip card] is how many places you can use it. Gerben said the Netherlands is the first - and so far the only - country to use a single card for bus, tram, subway, light rail and train, across multiple jurisdictions and companies. "And we are broadening the use outside towards public transport-related services, such as bicycle rental and taxi," he said. The Commonwealth Transportation Board will hold a public hearing on the proposed Six-Year Improvement Program (SYIP or Six-Year Plan) tonight, Wednesday, May 4 at the new VDOT District Office, Potomac Conference Center, 4975 Alliance Drive, Suite 1N201, Fairfax, VA 22030 starting at 7 p.m. This is a chance for cyclists to ask for better bicycle facilities in Northern Virginia. Below are draft FABB comments on the plan that we will present tonight. If you would like to make comments send them to six-yearprogram@vdot.virginia.gov. Thank you for this opportunity to comment on the Six Year Plan. We all know that maintenance of our roads and trails continues to be a problem. It's embarrassing how poorly our roads are maintained, with crumbling pavement and unswept debris that is a hazard to motorists and bicyclists, and vegetation blocking sight distance in many places. Bicyclists are affected more than most road users by these unsafe road hazards. When we hit a pothole, crack in the pavement, or debris we suffer much greater consequences than a motorist in a heavy vehicle. The FFX Co Parkway trail has never been repaved. It has grass growing in cracks and has no wayfinding signage in several places where the trail diverges from the parkway. Our group has asked that the trail be signed for the past 5 years without success. VDOT’s number one priority should be to repair and maintain our existing roads and trails. Maintenance crews are not to blame; they are likely just as frustrated as the rest of us. They need adequate funds to get their job done. 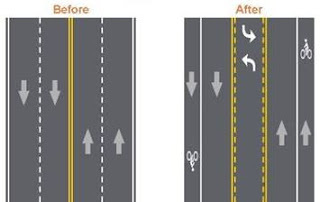 In many areas, VDOT is not adhering to their bike/ped policy which states that bike lanes and paved shoulders will be repaired, replaced and cleared of debris and snow and ice. It also states that shared use paths in the department right-of-way will be maintained through replacement and repair. We need a better plan to fix the billion+ in structurally deficient pavement on our roads and trails. Crash mitigation is another way to reduce congestion without building more capacity. According to AAA, “Forty to 50 percent of all nonrecurring congestion is associated with traffic incidents.” This should be obvious after listening to morning traffic reports on congestion and crashes in our area. From my reading of the SYIP, only $3M is devoted to this work in all of VA in FY2012, and nothing in FY13-17. We need to do a better job of mitigating these crashes by devoting appropriate resources to reduce their impact on congestion. We also hope that you will fully fund multi-modal access improvements in the Tysons area (Tysons Metrorail Access Improvement project (UPC 100469). In the SYIP only $19M of the requested $56M is being funded through 2017. Only $4M of the needed $14M for preliminary engineering in 2012 will be funded even though the Silver line Metro stations will open in 2013. In order for Metrorail to be successful, access to the stations needs to be improved for all modes. The county now has a plan for future bike facilities in Tysons and these facilities should be funded before the stations open. We agree with Governor McDonnell who said “Virginians must begin a fundamental shift in the way we travel to take greater advantage of the transportation options available to us today.” We do need better options, and bicycle facilities are an inexpensive, sustainable way to provide some of those options. And finally, to repeat comments from last year, it's time VDOT hired a bike coordinator and finalized the State Bicycle Policy Plan. It's inexcusable that the coordinator position has been vacant for nearly a year and a half. A Bicycle Safety Rodeo is planned on Saturday, May 7, ongoing from 1:00 to 4:00 p.m. (stop by anytime; course takes 20 minutes to complete) at the Lake Newport Pool Facility, 11601 Lake Newport Road. Join the Reston Association, State Farm Insurance, and The Reston Bicycle Club for the Annual Bicycle Safety Rodeo. Children will complete eight safety stations which include a bike inspection and earn their bicyclist's license. Children must bring their own bicycles and helmets. No registration required. If you have a bike you wish to donate for a child who may not have one, you can drop it off at this event. Bikes will be donated first to children who wish to participate in the Reston Kids Triathlon in August. Event will be canceled in the event of rain. Contact Ashleigh@reston.org or all 703.435.6577 for more information or weather-related cancellations. Bike edges car and bus in commute contest is the title of the Dr. Gridlock blog post on the bike/car/bus commute challenge we completed yesterday. Wright said he hoped the contest would show that cycling is a viable option for many people on a short commute. I hope it has a future for commuters who now drive short distances to Metro stations. That would help the commuters, because they would save the annoying cost of warehousing their cars all day at a Metro garage. And it would help the communities, because it might save the cost of building more of those concrete fortresses that now surround our outer Metro stations and allow that valuable land to be used for more productive purposes. As an instructor of bike courses developed by the League of American Bicyclists, including Traffic Skills 101, I teach students how to decide where to ride in the lane when riding on the road. Too often cyclists ride too far to the right, inviting motorists to try to share a lane that is too narrow, and as a result, they tend to pass too close to the cyclist. If a lane is less than 14 feet it cannot be easily shared with a motorist. When both vehicles are traveling at the same low speed, it may be possible to safely share a 12 or 13 foot lane where there is no on-road parking, but that is rarely the case. When the lane is less than 14 feet (see the AASHTO bike guide), cyclists need to ride far enough from the curb that motorists must pass safely. If they can't do so, they need to wait until either the lane is wider or then can pass safely. Is it right for the bicyclists to force sharing a non sharable road when they have a trail right there?... Perhaps we organize a campaign to put up road signs stating (no bicycles, use trail). Yes, I ride that trail on bicycle almost every Mon, Wed, Fri and Saturday and drive that road every weekday. Your concerns are commonly shared by many members of the public. However bicycling has a lot of counterintuitive truths. Why Do Bicyclists Insist on Exercising Their Legal Right to Use Roadways Adjacent To Trails? Another counterintuitive truth is that generally roadways are safer than trails. Trails have higher crash rates than roadways. While certainly a car/bike collision can lead to serious injuries and fatalities, unfortunately serious injuries and fatalities occur on trails. Bicyclists run into each other, run into fixed objects or simply lose control and fall. Trails often cannot safely accommodate the speeds that skilled bicyclists can achieve due to relatively narrow widths, tight curves, limited sight distances and sometimes worse overall pavement conditions than adjacent roadways. Another complicating factor [is] the presence of pedestrians, including children, dog walkers, and less skilled bicyclists. Often these folks are less predictable in their movements than motorists. Common speed limits on trails are 15 mph, a speed easily exceeded by skilled bicyclists. However a cyclist rarely exceeds the legal speed limit on a roadway. Drivers are welcome in DC, but they too should obey the law is the title of the WashCycle article in response to the Washington Post editorial entitled "Bicyclists are welcome in D.C., but they, too, should obey the law." It all starts with the title, which online is "Bicyclists are welcome in DC, but they too should obey the law." Which is confusing as hell, because it seems there is some group who obeys the law that bicyclists can join. But I can't for the life of me figure out who that group is. A better title would be "Bicyclists are welcome in DC, but they alone should obey the law." In the paper version the title is "Sharing the Streets: Bicyclists welcome. But please obey the law." Which is better, but I could hardly see the same message aimed at any other group. It seems to be proposing the old quid pro quo - if you obey the law, you'll be welcome; which is a standard no one else is held to. If I break the law, then ticket me, but I have a right to the road and I don't need the paper to tell me I'm welcome to use it anymore than I need them to tell me I'm welcome to vote. The rest of the article is well worth the time to read. It turns out that the fastest way to get to the Reston Town Center from the neighborhood near South Lakes High School, about 3 miles away, is to ride a bicycle. Bruce Wright of Fairfax Advocates for Better Bicycling (FABB) made the trip in just over 13 minutes. Another bicyclist who took the same route but rode at an easier pace, Kerie Hitt, also of FABB, arrived next 3 and a half minutes later. Delegate Ken Plum's trip in his hybrid car took him 19 minutes. Taking the long route with a ride through Hunter's Woods Village Center on the RIBS 2 bus on her way to the Town Center was Reston Association President and School Board candidate Kathleen Driscoll McKee. She had a leisurely trip of 50 minutes. "This was a good simulation that demonstrates real alternatives to the automobile for short trips in Reston and the rest of our community" noted Delegate Plum. He also said that short car trips are the least efficient, even for his hybrid car, which only averaged 30 mpg on the 3 mile trip. The group was met at the Pavilion by Supervisor Cathy Hudgins who is a long-time supporter of transportation alternatives for Hunter Mill District residents. She has supported Bike to Work Day in Reston from the beginning in 2002. The last several years she has appeared at the event on her folding bike. Bike to Work Day is Friday, May 20. The Reston event will be held at the Town Center Pavilion. Susan Stillman, who is a member of the Vienna Bicycle Advisory Committee and a FABB member, rode from Vienna to greet the group at the Pavilion and to congratulate Bruce. According to Bruce, "Riding a bike for transportation is a viable option for many people. What we showed today is that bicycling and driving travel times are very comparable for short trips, and bicycling costs much less and is better for the environment. I didn't use any foreign oil on the trip." While RA President Driscoll McKee had the longest trip, she noted that the RIBS 2 bus was nearly full during the trip. The fare was $1.50. As a bus rider she could read, check her email, or otherwise make productive use of her time. To schedule her trip we used WMATA's Trip Planner, entering an origin, destination, and either arrival or departure time and selecting from the options. When Metrorail arrives in Reston local bus routes will be modified to provide more frequent service for accessing the Wiehle and Reston Parkway stations, making them a much more attractive alternative to driving and paying to park. See coverage of the event on the Reston Patch, including a video segment. See additional photos from the event. Photos by Mike McKee.